Clinical Highlights for the Rheumatologist. Share your recent findings by contributing to The Journal. Whether you're on the go or in the office, we keep you updated with our monthly Podcast. Your article deserves to be read. Find out how a video abstract can attract more readers. 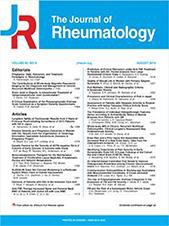 The Journal of Rheumatology is a monthly international serial, published online and in print, featuring research articles on clinical subjects from scientists working in rheumatology and related fields. Clinical Highlights for the Rheumatologist is a bi-monthly collection of articles picked by the Editor-in-Chief from the latest issues of The Journal of Rheumatology with print distribution to US rheumatologists. Our publisher services site supports these publication activities by providing information and services to authors, reviewers, readers, and those seeking media services including reprints and permissions, and online and print advertising, as well as physician trainee participants signed up for our rheumatology trainee forum. Information for authors preparing their articles for submission. Information for new reviewers on assessing submitted articles. For rheumatologists and physician trainees interested in participating in discussions about selected Journal articles. Subscriptions information and purchase via e-commerce for individuals, institutions, and corporate organizations. Learn about subscription options and licenses to The Journal. Information for authors, researchers, publishers, and pharmaceutical companies about reprints and permissions to published content. Information on print and online advertising opportunities in The Journal of Rheumatology and our US Edition Clinical Highlights for the Rheumatologist, including print and online advertising rates, ad specifications, and representative contact information. Secure credit card online payment service for authors, advertisers, reprint, permissions, and other customers paying invoices, including publication charges, reprint/supplement prepayments, permission fees, single copy purchases, etc.